Are you registered to vote? Are your friends? 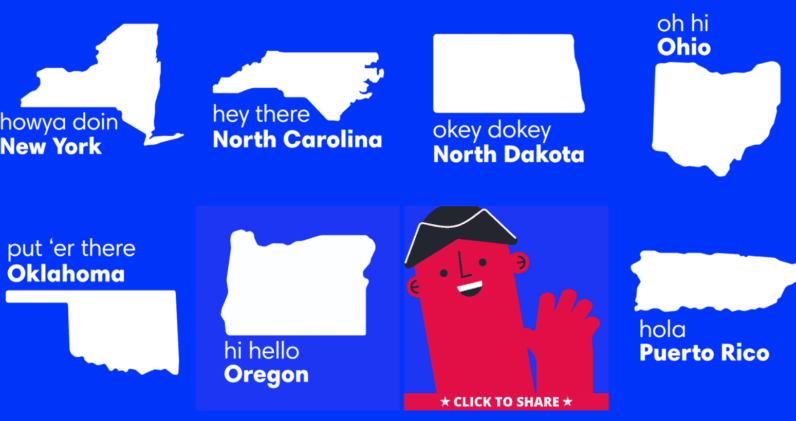 Every election, we hear about disappointing voter turnout rates, so one designer decided to use the medium everyone enjoys to encourage and remind people when they should be registered by. Brooklyn-based Erica Gorochow created VoteGif with customized art and voting deadline information for every state (plus Puerto Rico) so they can be easily shared on the internet and remind peers in your state when they need to get their act together. Each GIF has an adorable artwork featuring a characteristic the state is known for, such as Lady Liberty for New York and a country musician for Tennessee. It’s a small but potentially impactful project that could help spread the message to voters. US turnout in the 2012 presidential election was only 53.6 percent of the estimated voting-age population; young voters in particular (ages 18-24) accounted for just 19 percent of the turnout. Have a look, browse for your state, and make sure you exercise your right this November.